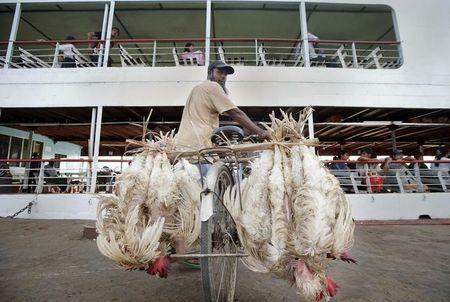 YANGON (Reuters) - Myanmar has culled thousands of poultry to try to contain an outbreak of H5N1 bird flu in Monywa, west of the commercial centre of Mandalay, health officials said on Thursday. The first outbreak of H5N1 in Myanmar was in the same region, about 525 miles (840 km) northwest of Yangon, in 2006and the last outbreak was in western Rakhine State in January 2011. The disease was brought under control and was not known to have spread to humans. An official said more than 1,400 chickens and 10,000 quail had died in the Monywa outbreak early this month and about 1,500 chickens and more than 20,000 quail had since been culled. H5N1, which first infected humans in 1997 in Hong Kong, has since spread from Asia to Europe and Africa and has become entrenched in poultry in some countries, causing millions of poultry infections and several hundred human deaths.